For her granddaughter, the Queen consort of Sweden and Norway, see Josephine of Leuchtenberg. Marie Josèphe Rose Tascher de La Pagerie was born in Les Trois-Îlets, Martinique, to a wealthy French Creole family that owned a sugarcane plantation, which is now a museum. She was the eldest daughter of Joseph-Gaspard Tascher (1735–1790), knight, Seigneur de (lord of) la Pagerie, lieutenant of Troupes de Marine, and his wife, the former Rose-Claire des Vergers de Sannois (1736–1807), whose maternal grandfather, Anthony Brown, may have been Irish. The family struggled financially after hurricanes destroyed their estate in 1766. Edmée (French, Desirée), Joséphine's paternal aunt, had been the mistress of François, Marquis de Beauharnais, a French aristocrat. When François's health began to fail, Edmée arranged the advantageous marriage of her niece, Catherine-Désirée, to François's son Alexandre. This marriage would be highly beneficial for the Tascher family, because it kept the Beauharnais money in their hands; however, 12-year-old Catherine died on 16 October 1777, before she could leave Martinique for France. In service to their aunt Edmée's goals, Catherine was replaced by her older sister, Joséphine. In October 1779, Joséphine went to France with her father. She married Alexandre on 13 December 1779, in Noisy-le-Grand. They had two children: a son, Eugène de Beauharnais (1781–1824), and a daughter, Hortense de Beauharnais (1783–1837) (who later married Napoleon's brother Louis Bonaparte in 1802). Joséphine and Alexandre's marriage was not a happy one. Alexandre abandoned his family for over a year in a brief tryst and often frequented whorehouses, leading to a court-ordered separation during which Josephine and the children lived at Alexandre's expense in the Pentemont Abbey, run by a group of Bernardian nuns. On 2 March 1794, during the Reign of Terror, the Committee of Public Safety ordered the arrest of her husband. He was jailed in the Carmes prison in Paris. Considering Joséphine as too close to the counter-revolutionary financial circles, the Committee ordered her arrest on 18 April 1794. A warrant of arrest was issued against her on 2 Floréal, year II (April 21, 1794), and she was imprisoned in the Carmes prison until 10 Thermidor, year II (28 July 1794). During this time, Joséphine was only allowed to communicate with her children by their scrawls on the laundry list, which the jailers soon prohibited. Her husband was accused of having poorly defended Mainz in July 1793, and being considered an aristocratic "suspect", was sentenced to death and guillotined, with his cousin Augustin, on 23 July 1794, on the Place de la Révolution (today's Place de la Concorde) in Paris. Joséphine was freed five days later, thanks to the fall and execution of Robespierre, which ended the Reign of Terror. On 27 July 1794 (9 Thermidor), Tallien arranged the liberation of Thérèse Cabarrus, and soon after that of Joséphine. In June 1795, a new law allowed her to recover the possessions of Alexandre. Madame de Beauharnais had affairs with several leading political figures, including Paul François Jean Nicolas Barras. In 1795, she met Napoleon Bonaparte, six years her junior, and became his mistress. In a letter to her in December, he wrote, "I awake full of you. Your image and the memory of last night’s intoxicating pleasures has left no rest to my senses." In January 1796, Napoleon Bonaparte proposed to her and they were married on 9 March. Until meeting Bonaparte, she was known as Rose, but Bonaparte preferred to call her Joséphine, the name she adopted from then on. Joséphine, left behind in Paris, in 1796 began an affair with a handsome Hussar lieutenant, Hippolyte Charles. Rumors of the affair reached Napoleon; he was infuriated, and his love for her changed entirely. In 1798, Napoleon led a French army to Egypt. During this campaign, Napoleon started an affair of his own with Pauline Fourès, the wife of a junior officer, who became known as "Napoleon's Cleopatra." The relationship between Joséphine and Napoleon was never the same after this. His letters became less loving. No subsequent lovers of Joséphine are recorded, but Napoleon had sexual affairs with several other women. In 1804, he said, "Power is my mistress." In December 1800, Joséphine was nearly killed in the Plot of the rue Saint-Nicaise, an attempt on Napoleon's life with a bomb planted in a parked cart. On December 24, she and Napoleon went to see a performance of Joseph Haydn's Creation at the Opéra, accompanied by several friends and family. The party travelled in two carriages. Joséphine was in the second, with her daughter, Hortense; her pregnant sister-in-law, Caroline Murat; and General Jean Rapp. Joséphine had delayed the party while getting a new silk shawl draped correctly, and Napoleon went ahead in the first carriage. The bomb exploded as her carriage was passing. The bomb killed several bystanders and one of the carriage horses, and blew out the carriage's windows; Hortense was struck in the hand by flying glass. There were no other injuries and the party proceeded to the Opéra. The coronation ceremony, officiated by Pope Pius VII, took place at Notre Dame de Paris, on 2 December 1804. Following a pre-arranged protocol, Napoleon first crowned himself, then put the crown on Joséphine's head, proclaiming her empress. In her role as empress, Napoleon had a court appointed to her and reinstated the offices which composed the household of the queen before the French revolution, with Adélaïde de La Rochefoucauld as Première dame d'honneur, Émilie de Beauharnais as Dame d'atour, and the wives of his own officials and generals, Jeanne Charlotte du Lucay, Madame de Rémusat, Elisabeth Baude de Talhouët, Lauriston, d'Arberg, Marie Antoinette Duchâtel, Sophie de Segur, Séran, Colbert, Savary and Aglaé Louise Auguié Ney, as Dame de Palais. Shortly before their coronation, there was an incident at the Château de Saint-Cloud that nearly sundered the marriage between the two. Joséphine caught Napoleon in the bedroom of her lady-in-waiting, Élisabeth de Vaudey, and Napoleon threatened to divorce her as she had not produced an heir. Eventually, however, through the efforts of her daughter Hortense, the two were reconciled. When after a few years it became clear she could not have a child, Napoleon, while still loving Joséphine, began to think very seriously about the possibility of divorce. The final die was cast when Joséphine's grandson Napoléon Charles Bonaparte, who had been declared Napoleon's heir, died of croup in 1807. Napoleon began to create lists of eligible princesses. At dinner on 30 November 1809, he let Joséphine know that -in the interest of France- he must find a wife who could produce an heir. Joséphine agreed to the divorce so the Emperor could remarry in the hope of having an heir. The divorce ceremony took place on 10 January 1810 and was a grand but solemn social occasion, and each read a statement of devotion to the other. On March 11, Napoleon married Marie-Louise of Austria by proxy; the formal ceremony took place at the Louvre in April. Napoleon once remarked that despite her quick infatuation with him "It is a womb that I am marrying". 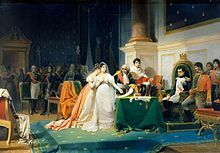 Even after their separation, Napoleon insisted Joséphine retain the title of empress. "It is my will that she retain the rank and title of empress, and especially that she never doubt my sentiments, and that she ever hold me as her best and dearest friend." In March 1811 Marie Louise delivered a long-awaited heir, to whom Napoleon gave the title "King of Rome". Two years later Napoleon arranged for Joséphine to meet the young prince "who had cost her so many tears". Joséphine died in Rueil-Malmaison on 29 May 1814, soon after walking with Tsar Alexander I of Russia in the gardens of Malmaison. She was buried in the nearby church of Saint Pierre-Saint Paul in Rueil. Her daughter Hortense is interred near her. "I have met with several well-informed persons in St. Lucia, who entertain the conviction that Mademoiselle Tascher de La Pagerie, better known as Empress Josephine, was born in the island of Saint Lucia and not Martinique as commonly supposed. Amongst others the late Sir John Jeremie appears to have been strongly pressed with the idea. Henry Breen also received confirmation from Josephine's former slave nanny called "Dede", who claimed she nursed Josephine at La Cauzette. Josephine's baptism was administered by Pere Emmanuel Capuchin at Trois-Ilets but he has only stated she had been baptized there but not born. Dom Daviot, parish priest in Gros Islet, wrote a letter to one of his friends in Haute-Saône in 1802 in which he states: "it is in the vicinity of my parish that the wife of the first consul was born," at the time, Paix Bouche was a part of Castries; he asserts that he was well acquainted with Josephine's cousin who was a parishioner. Josephine's father owned an estate in Soufriere Quarter called Malmaison, the name of her now famous French residence. It is also assumed that the de Taschers estate in Martinique was a pied-a-terre [occasional lodging] with his mother-in-law. St Lucia switched hands between England and France 14 times and at the time of Joesphine's birth there were no civil registers on the island that would explain her baptism in Martinique; however, St. Lucia's frequent change of ownership between England and France could be seen as the reason Josephine's birthplace was left out on her Birth record as it would have affected her nationality. Joséphine's eldest granddaughter, Joséphine, Queen consort of Sweden and Norway. Portrait by Fredric Westin. Hortense's son became Napoleon III, Emperor of the French. Eugène's son Maximilian de Beauharnais, 3rd Duke of Leuchtenberg married into the Russian Imperial family, was granted the style of Imperial Highness and founded the Russian line of the Beauharnais family, while Eugene's daughter Joséphine married King Oscar I of Sweden, the son of Napoleon's one-time fiancée, Désirée Clary. Through her, Joséphine is a direct ancestor of the present heads of the royal houses of Belgium, Denmark, Luxembourg, Norway and Sweden and of the grandducal house of Baden. A number of jewels worn by modern-day royals are often said to have been worn by Joséphine. Through the Leuchtenberg inheritance, the Norwegian royal family possesses an emerald and diamond parure said to have been Joséphine's. The Swedish royal family owns several pieces of jewelry frequently linked to Joséphine, including the Leuchtenberg Sapphire Parure, a suite of amethyst jewels, and the Cameo Parure, worn by Sweden's royal brides. However, a number of these jewels were probably never a part of Joséphine's collection at all, but instead belonged to other members of her family. Another of Eugène's daughters, Amélie de Beauharnais von Leuchtenberg, married Emperor Pedro I of Brazil in Rio de Janeiro, and became Empress of Brazil, and they had one surviving daughter, Princess Maria Amélia of Brazil, who was briefly engaged to Archduke Maximilian of Austria before her early death. Time journalist Nathalie Alexandria Kotchoubey de Beauharnais, was a direct descendant of Joséphine through her son Eugène and the Russian line founded by Josephine's grandson Maximilian de Beauharnais, 3rd Duke of Leuchtenberg. She married André Laguerre, longtime managing editor of Sports Illustrated in 1955 and had two daughters, Michèle and Claudine. Joséphine de Beauharnais's extended family member Stéphanie de Beauharnais is an ancestor to Albert II, Prince of Monaco, through her daughter Princess Marie Amelie of Baden, and of the present heads of the princely house of Hohenzollern and royal houses of Romania, Yugoslavia and Italy, through her daughter Princess Josephine of Baden. Biographer Carolly Erickson wrote, “In choosing her lovers Rose [Josephine] followed her head first, then her heart”, meaning that she was adept in terms of identifying the men who were most capable of fulfilling her financial and social needs. She was not unaware of Napoleon's potential. Joséphine was a renowned spendthrift and Barras may have encouraged the relationship with Général Bonaparte in order to get her off his hands. Josephine was naturally full of kindness, generosity and charm, and was praised as an engaging hostess. In 1799 while Napoleon was in Egypt, Josephine purchased the Chateau de Malmaison. She had it landscaped in an “English” style, hiring landscapers and horticulturalists from the United Kingdom. These included Thomas Blaikie, a Scottish horticultural expert, another Scottish gardener, Alexander Howatson, the botanist, Ventenat, and the horticulturist, Andre Dupont. The rose garden was begun soon after purchase; inspired by Dupont’s love of roses. Josephine took a personal interest in the gardens and the roses, and learned a great deal about botany and horticulture from her staff. Josephine wanted to collect all known roses so Napoleon ordered his warship commanders to search all seized vessels for plants to be forwarded to Malmaison. Pierre-Joseph Redouté was commissioned by her to paint the flowers from her gardens. Les Roses was published 1817–20 with 168 plates of roses; 75–80 of the roses grew at Malmaison. The English nurseryman Kennedy was a major supplier, despite England and France being at war, his shipments were allowed to cross blockades. Specifically, when Hume’s Blush Tea-Scented China was imported to England from China, the British and French Admiralties made arrangements in 1810 for specimens to cross naval blockades for Josephine’s garden. Sir Joseph Banks, Director of the Royal Botanic Gardens, Kew, also sent her roses. The general assumption is that she had about 250 roses in her garden when she died in 1814. Unfortunately the roses were not catalogued during her tenure. There may have been only 197 rose varieties in existence in 1814, according to calculations by Jules Gravereaux of Roseraie de l’Haye. There were 12 species, about 40 centifolias, mosses and damasks, 20 Bengals, and about 100 gallicas. The botanist Claude Antoine Thory, who wrote the descriptions for Redouté’s paintings in Les Roses, noted that Josephine’s Bengal rose R. indica had black spots on it. She produced the first written history of the cultivation of roses, and is believed to have hosted the first rose exhibition, in 1810. Brenner and Scanniello call her the "Godmother of modern rosomaniacs" and attribute her with our modern style of vernacular cultivar names as opposed to Latinized, pseudo-scientific cultivar names. For instance, R. alba incarnata became "Cuisse de Nymphe Emue" in her garden. After Josephine’s death in 1814 the house was vacant at times, the garden and house ransacked and vandalised, and the garden’s remains were destroyed in a battle in 1870. The rose 'Souvenir de la Malmaison' appeared in 1844, 30 years after her death, named in her honor by a Russian Grand Duke planting one of the first specimens in the Imperial Garden in St. Petersburg. In 1859 Napoleon III commissioned a statue of Josephine for La Savane Park in downtown Fort-de-France, Martinique. In 1991 it was decapitated and shortly afterwards spattered with red paint. These acts were said to be for Josephine's alleged role in convincing Napoleon to reinstitute slavery in the French colonies. (Although in fact Martinique, under first Royalist, then English, rule never accepted the emancipation degree issued by the Revolutionary government.) The head has never been found. Fields, Bertram (2015). Destiny: A Novel Of Napoleon & Josephine. Gulland, Sandra (1995). The Many Lives & Secret Sorrows of Josephine B.
Winterson, Jeanette (1987). The Passion. Mossiker, Frances (1971) More than a queen; The story of Josephine Bonaparte. Napoléon is a historical DVD TV miniseries of Napoleon's life, in which Josephine features prominently, portrayed by Isabella Rossellini. In 2015 and 2017, an episode of Horrible Histories called "Naughty Napoleon" and "Ridiculous Romantics" featured Natalie Walter and Gemma Whelan, portraying Joséphine de Beauharnais. The love song 'Josephine' from The Magnetic Fields' 1991 album Distant Plastic Trees: "If I were Napoleon, you could be my Josephine ..."
The song 'Josephine' from Frank Turner's 2015 album Positive Songs for Negative People references Josephine — as well as Josephine Brunsvik — to portray Turner's wish that he has his own muse to influence him. The song 'Josephine' from Tori Amos' 1999 partially live album To Venus and Back references the pop-culture expression, supposedly spoken by Napoleon: "Not tonight, Josephine". ^ Epton, Nina (1975). Josephine, the Empress and Her Children. New York: W. W. Norton & Company, Inc., pp. 54, 66–67. ^ "Madame Pauline Fourès-Napoleon's Cleopatra". ^ "Napoleon: Napoleon and Josephine". PBS. Retrieved 2018-12-29. ^ Esdaile, Charles (2009-10-27). Napoleon's Wars: An International History. Penguin. ISBN 9781101464373. ^ Arnold, James R. (1995). Napoleon Conquers Austria: The 1809 Campaign for Vienna. Greenwood Publishing Group. p. 194. ISBN 9780275946944. 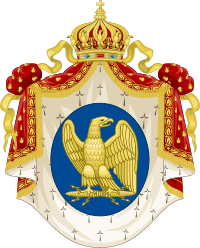 ^ "Empress Josephine's short biography in Napoleon & Empire website, displaying photographs of the castle of Malmaison and the grave of Josephine". Napoleon-empire.com. 2011-06-11. Retrieved 2012-06-06. ^ "Joséphine's Jewels: Myths and Legends | The Court Jeweller". www.thecourtjeweller.com. Retrieved 2016-05-16. ^ Kay, Ella. "Tiara Timeline: The Norwegian Emerald Parure Tiara". The Court Jeweller. Retrieved 30 May 2015. ^ "Empress Joséphine's Emerald Tiara". Order of Splendor. ^ Kay, Ella. "Tiara Timeline: The Leuchtenberg Sapphire Tiara". The Court Jeweller. Retrieved 30 May 2015. ^ "The Leuchtenberg Sapphire Parure". Order of Splendor. ^ "The Cameo Tiara". Order of Splendor. ^ Kay, Ella. "Joséphine's Jewels: Myths and Legends". The Court Jeweller. Retrieved 30 May 2015. ^ "Person Page 6746". thePeerage.com. 2004-09-22. Retrieved 2010-04-14. ^ "Gift by HRH the Prince of Monaco to the Fondation Napoléon - napoleon.org". Retrieved 2016-08-29. ^ (in French) Études biographiques - Les descendants de la duchesse de Leuchtenberg et sa parenté, www.napoleon.org. Retrieved 2017-09-13. ^ Menkes, Suzy (1996-07-08). "Galliano's Empire Line Shines for Givenchy". The New York Times. ISSN 0362-4331. Retrieved 2016-09-08. Aronson, Theo (1990). Napoleon and Josephine: A Love Story. St Martins Pr. ISBN 0-312-05135-2. Castelot, André (2009). Josephine. Ishi Press. ISBN 4-87187-853-8. Erickson, Carolly (1998). Josephine; A Life of the Empress. St. Martin's Press. ISBN 1-86105-637-0. Mossiker, Frances (1964). Napoleon and Josephine; the Biography of a Marriage. Simon and Schuster. ISBN 978-0-00-000000-2. Sergeant, Philip (1909). The Empress Josephine, Napoleon's Enchantress. NY: Hutchinson's Library of Standard Lives. Wikimedia Commons has media related to Joséphine de Beauharnais. Empress Josephine by Ernest John Knapton. Complete transcription of the 1963 biography. Château de Malmaison (in French), Joséphine's residence from 1799 to 1814, the site of her death.